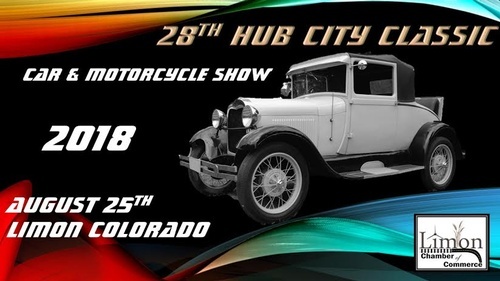 This will be the 29th year for the Hub City Classic Car and Motor Cycle Show! Bigger and better than ever! (see flyer for more intformation). Cash Prizes awarded, more classes than ever! The downtown streets of Limon come alive on this day long event. Early morning begins with 5K run at 7:00 AM registration; vendor set up begins at 8:00AM; Car Registration begins at 8:00AM; Vendor Booths; open at 10:00 AM; Parade of Cars starts at 11:00 AM; kids games and events run all day long in different areas; Cash prizes for winners in each class. All day - from 7:00AM- 10:00PM- all events take place in the downtown area. food booths, kids games, soap box races, pine wood derby and much much more.